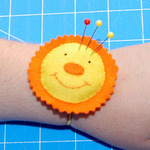 This summer the pincushion challenge theme is "summer". It was super easy to make. We drink a lot of gatorade here and I have been anxious to create a wrist cushion ever since I saw this great tutorial over at "my little mochi". 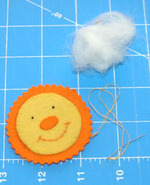 For the sunshine: I traced a 60 mm circle on orange felt (disappearing ink) and cut using pinking sheers. Then, I cut the embroidered circle and stitched it to the orange sunburst. I left about a 1/4 inch open to stuff the face with poly-fil before finishing off. 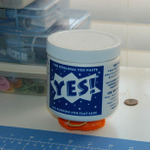 I added a little bit of fabric glue in the cap and added poly-fil for extra padding. Finally, I added some fabric glue to the rim and poly-fil and placed "Sunny" on top. Use something heavy to keep in place while it's drying. I left it like this for about 30 minutes. There is still time to participate in the pincushion challenge. The deadline is end of July. Give it a try, the possibilities are endless. I'm thinking I may do a little monkey face next! Roz, this is just wonderful. Thanks for all the step by step! The pincushion is so colorful and 'sunny'. This is a page I will save so that I can create a similar pin cushion. Just great! Oh good! I hope you give it a go. It is really a great visual and soul feat for me after reading you blog.I really enjoys your blog which is different from others. There is no doubt that they really outstanding. WISH YOU SMAIL EVERYDAY! Freely have you received; freely give! I'd like to read more from you,expecting your new articles. it is so good do you think so ? it is so nice day ! ni zi gan shenm ? Mothers Day is actually a day for children to recognise all the difficult perform and commitment offered to them by their mothers. This is the beautiful stuff that I have seen in this site not knowing that it is a pincushion. Thank you for sharing the tutorial that is posted here. I will probably make this in my home. 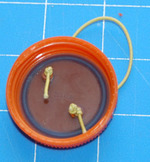 I created a visit to the present post as a result of I wish to create this stunning pincushion that's presented in here. Actually, I even have sort of totally different beautiful pincushions as a set when Grandma created it. I enjoy making of these stuff for my kids but it’s not a pincushion. I will share this to my friends at work. This blog is really Cute, I love to do this at home. Please post more. It was my friend shared this tutorial. In fact, I’ve made different colors for the project of my daughter. My friend was happy of this, when show this to her. She is excited to make this beautiful pincushion.